Finding hoop-making supplies in Japan has taken lots of research, trial and error, plus great tips from hooping friends. I want to share my resources with you so can get your own hoop factory started. If you have any tips about alternate supplies or resources, please share them in the comments! Vinyl tape comes in many colors and is inexpensive. Standard roll size is 10m and 19mm wide. One roll will cover an 80cm hoop if you tape neatly. Online vendors are convenient for large orders – tape is heavy to haul around town. I use Rakuten for my online shopping, but Yahoo and Amazon also have tape. ダイソ Daiso sells only primary colors, but at 3 rolls for 100 yen, you can’t go too wrong. Local hardware stores carry a range of basic colors and some shops have the pastels ones, too. The most difficult color to find is purple. 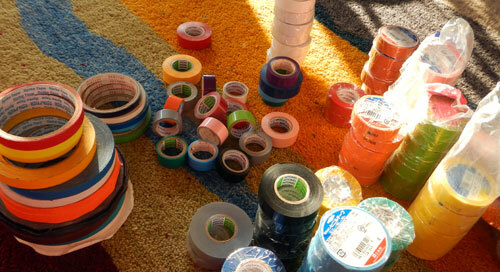 This is the stuff to search for: ヤマト ビニールテープ NO.200-19 紫 There is also a 3M brand purple tape; it is about 500 yen/20m roll. Gaffer tape is made of fabric; we use it to add grip to our hoops. To glitter and shine your hoops, fancy and shiny tapes are fun but a little hard to get. Beware of tape without adhesive that is used for streamers at parties and events. It comes on rolls and looks exactly like adhesive tape but should say 粘着加工はしておりません on the label. ダイソと１００円店 Daiso & 100 yen stores. It’s a bit hit or miss, but sometimes you’ll find unique deco tapes, including thin metallic tapes. Tokyu Hands, art stores, and stationers sell “cutting sheet” which is self-adhesive colored vinyl by the meter. 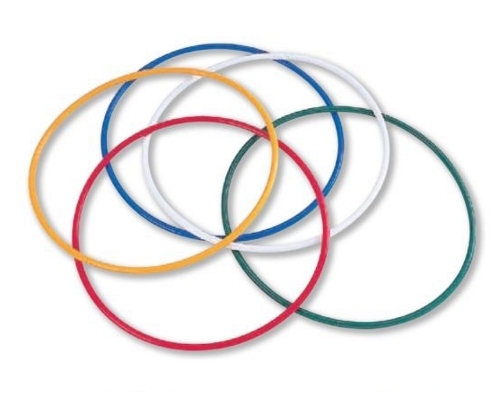 It can be cut to any width strip for taping hoops and comes in a variety of colors, including holographic patterns. Hardware stores carry adhesive vinyl shelf papers in matte patterns and colors. Can be cut into strips for hoop tape. コネクター Connectors can be made from a range of materials – from pipe to wood dowels to wine corks. The key to a good connector is a tight fit. Check the inner diameter (ID) of the hoop pipe to help you find the right size. If your connector is too small, try wrapping it with vinyl tape. ホワイト丸パイプ White Maru Pipe is stiff and suitable for rivet closures with PEX pipes. It has a tendency to crack with heavy use. Number 15 fits into PEX 13A; 18 fits 16A. Insert connectors. I have yet to find these PVC treasures in Japan. ブラィンドリベット Blind rivets can be found in nearly any hardware store. I use ones with an aluminum flange and steel shaft, diameter 2.4mm and length 3.2-6.4mm. Any rivet long enough to fit through both your hoop pipe and connector will work. Make sure you have a drill bit of the correct size. 樹脂チューブカッタ Ratcheting pipe cutter is a key tool to making tidy cuts in your pipe. They cost about 2500 and are a wise investment if you are going to make a lot of hoops. Super helpful post, Tink! Thanks for sharing all your research! BTW, can you just get the ホワイト丸パイプ at any hardware type store, do you reckon? 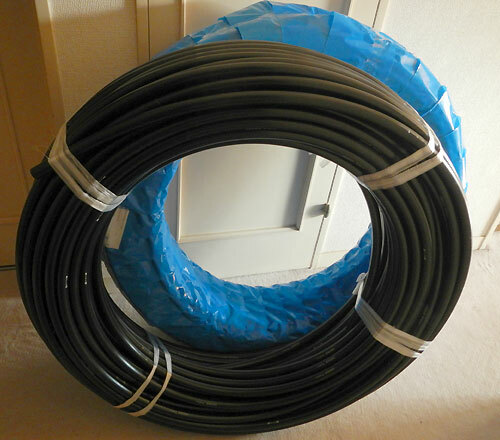 I got 水道用ポリエチレン管１３ｍｍ ｘ ３０ｍ at a place called Joyful Honda in Ota, Gunma. (They have other locations: http://www.joyfulhonda.com/english/index.htm) (内径１３㎜　外径２１．５㎜）It was fairly cheap and you can buy less if you want. They’ll cut it. They also have the plastic insert connectors (though they’re technically meant for other tubing and the salespeople will look at you like you don’t know what you’re talking about). The guy there referred to them as takenoko since they look like takenoko. The center bit is quite wide, so I’ve been cutting it off. My local Sekichu (hardware store type place) also has the takenoko connectors, but no pipe. Great info, thanks! The Joyful Honda I visited in Utsunomiya only had double-wall poly. We tried it and it was heavy and a little bit too soft for my taste. It worked, though I wouldn’t recommend it. I’ll search out the takenoko connectors online and add them and the hint about JH to the list. Thanks again!